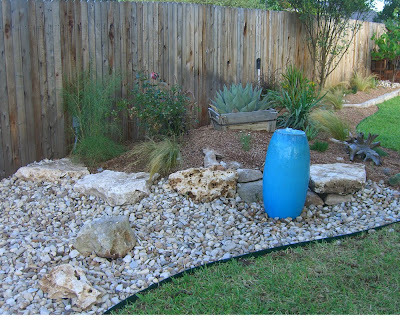 After a brutally hot summer with "exceptional drought," Austin has been soaked regularly for the past many weeks. The plants all breathed a huge sigh of relief, then took off in a race to grow as much as possible before cold strikes. My new garden, which I crazily installed in the midst of the inferno, has really taken off. 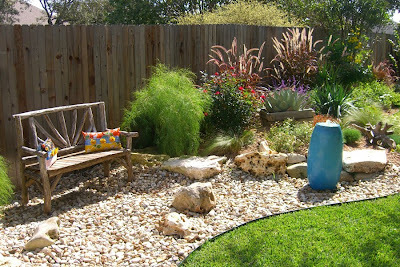 I've torn out all the beds around the patio, and I am busily plotting some more work, to extend this look. 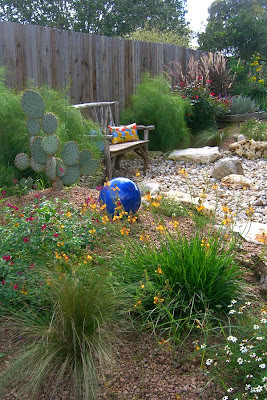 Fall is a great time for gardening in Austin. 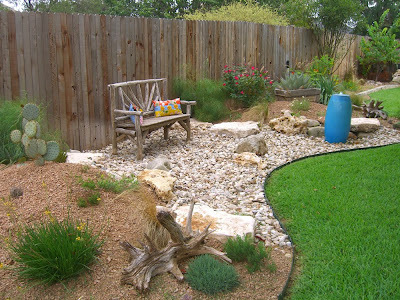 Plants include Mexican feather grass, purple fountain grass, bamboo muhly grass, Mexican bush sage, blackfoot daisy, bulbine, Santa Rita prickly pear, Knockout roses, yellow bells (esperanza), Texas gold lantana, Autumn sage (salvia greggii), softleaf yucca and a specimen agave.